This year I inked a contract with Falcon Guides to write my first book. 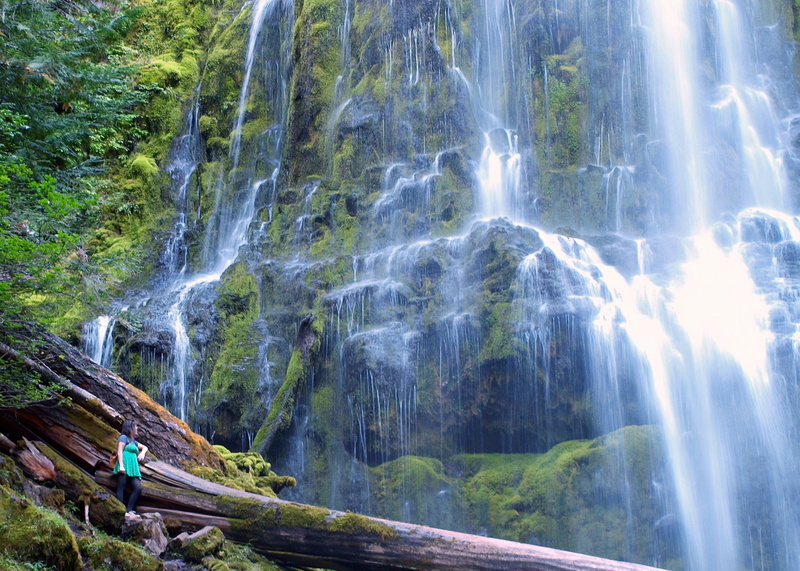 The guidebook, “Hiking Waterfalls in Oregon” will be a comprehensive list of what I consider to be the best waterfall hikes in the entire state of Oregon. And even though some of the state’s most scenic cascades require little or no hiking at all, I’m throwing those in as well just so folks don’t miss them. Obviously this is a bit of an undertaking. There will be a lot of road hours, hiking, waterfall hunting, picture taking, camping, lodging, and eating involved. Bummer. Lucky for me the state of Oregon is chock-full of, and I mean chock-full of people that want to help me make this guidebook: Visitors Associations, hotels, resorts, restaurants, Chambers of Commerce, helpful locals, etc, etc. This book will be an amazing amount of work, but imagine; I’m getting paid to travel the state and hike to waterfalls. For me, this is the gig I’d always hoped to land when I left the information technology field a few years ago, and it is un-flipping believable. It seemed like a good idea to do a blog post about some of the major “research” trips I take for the guidebook. So here we go….Central Oregon! First and foremost, massive, heaping piles of thanks go to Kristine McConnell from the Central Oregon Visitors Association for putting this trip together. She put hours of work and research into coming up with an itinerary that would optimize my time out there. She also assembled a “Coalition of the Willing” that would generously provide lodging for the trip. I would be joined on this expedition by my best friend, housemate, and fellow waterfall enthusiast, Kassidy. As a man without wheels I rely on friends to take me out on waterfall research excursions. While the promise of an appearance in the Acknowledgements section of a guidebook might seem like a carrot to some, the opportunity for a nearly free waterfall hunting vacation appears to be what does it for my friends. These arrangements are win/win in the truest sense. On day 1 Kass and I loaded up and left Portland for Central Oregon. It was a magnificent fall day for a drive. A drive that got all the better when we made it to the McKenzie Scenic Byway. I have to chuckle to myself in retrospect because calling this drive “scenic” is like calling Marilyn Monroe “cute”. Our first official stop was along the McKenzie River. 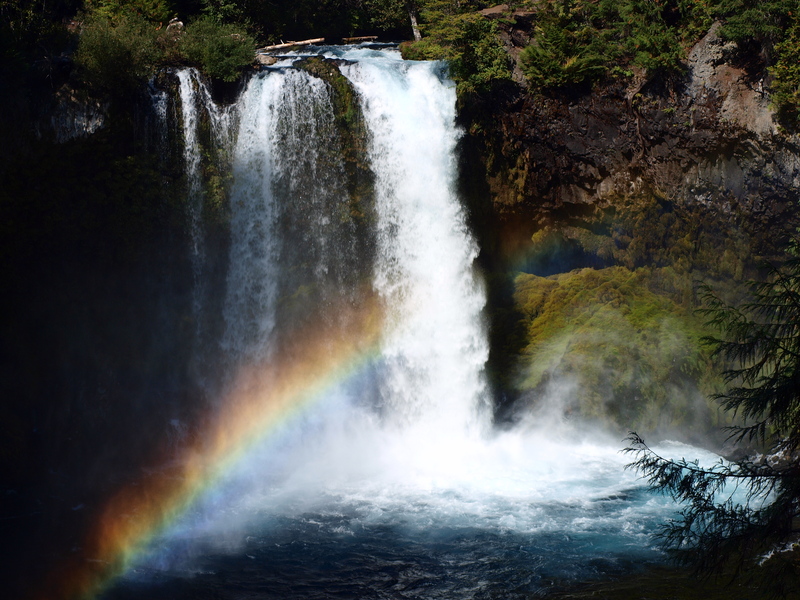 We took a 4 mile loop hike that gave us every conceivable view of Sahalie and Koosah Falls. Thundering waterfalls, clean rushing waters, and lush forest all played an equal role in the appeal of this hike. I had never done this hike before, and it was a heck of a way to kick off the trip. We continued on to Proxy Falls. Upper and Lower Proxy Falls were perhaps, more than any other waterfalls we were scheduled to see, the ones I was looking forward to the most. Before this trip I had never seen them with my own eyes, but lower Proxy is one of the most renowned falls in all of Oregon. It draws photographers in droves and is one of those “Must be seen in person” waterfalls. Those are my favorite. They lived up to and even exceeded my expectations, in part because Lower Proxy is just so large. Look at this picture. If you gaze hard enough you can spot Kass in the lower left-hand corner. This is just a small segment of the left branch of the lower falls! What also made these falls well worth the trip was the hike to them. It’s a short 2 miles, but along the way you get 2 waterfalls in a dense forest setting as well as a delightful open and arid lava field. This I would come to find out is one of the most incredible things about the region. Remarkable geographic diversity, often within a single hike! We were done with waterfalls for the day but that didn’t mean we were done checking out the things that needed to be checked out. Along the Scenic Byway on the drive into the town of Sisters, is the Dee Wright Observatory. 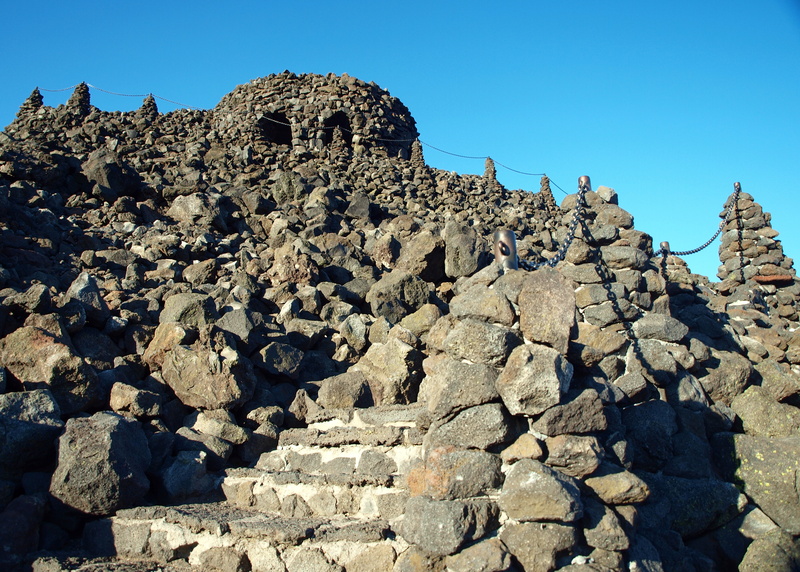 Constructed out of lava rock, the observatory sits like a witch’s castle at the summit of the McKenzie Pass. Within the structure there are “lava tubes” or little viewing windows showing all of the named peaks in the area. If you’re in the area and you fail to stop at it you will bring shame upon your family. After a leg stretch at the observatory we got back into the car and made the final push to our home for the night; the Five Pine Lodge in the town of Sisters. The green built Five Pine Lodge is an amazing place. It is essentially a campus with a gift shop, a spa, the Three Creeks Brewing Company, the Sisters Athletic Club, and the Sisters Movie House all on the property; and of course, the cabins. 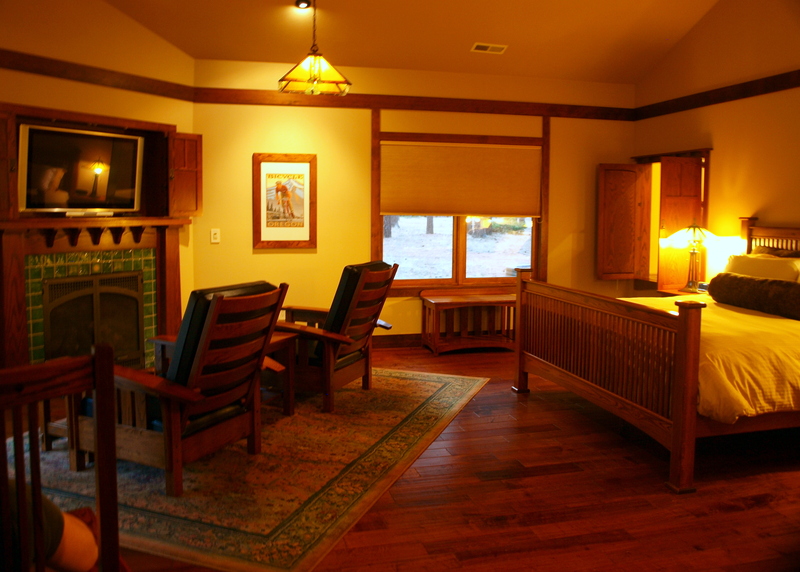 We stayed in one of the Classic Cabins, and by no stretch of the imagination were we roughing it. Our rustic little guy was equipped with two beds, including a king deluxe, pillow top Simmons FivePine mattress, a 42” plasma flat screen television, a fireplace, an Italian tiled shower and a Kohler Purist waterfall soaking tub. How’s that for a classic cabin? It was a very memorable and productive day, and this was just the start. We settled in for the evening and were both asleep relatively early. Unfortunately as we rested, illness would settle in on the both of us. Welcome to my neck of the woods! : ) Great shots!